Lake Nona might technically be part of the incorporated city of Orlando, but its residents enjoy a completely different pace of life. Located on 7,000 acres, this master-planned community functions more like a city within a city than a subdivision. Found within Orange County, Lake Nona homes deliver all of the advantages of big-town living in a community that offers small-town flair. Residents here enjoy their own schools, parks and attractions. They are also provided with plenty of places to shop and dine and even work. While many residents in Lake Nona do work in the greater Orlando area, the community does offer its own share of employment opportunities, as well. 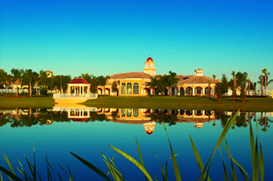 Located in Central Florida, Lake Nona is a very impressive community. Lake Nona offers incredible amenities with diverse workspace and Real Estate options. The communities has an abundance of retail and entertainment, next to a medical and biotechnology park, with educations ranging from Kindergarten to graduate level and best of all 40% of the area is left green, with about 44 miles of paved and unpaved trails for outside activities like hiking, biking and exploring nature. Buyers working with Bustamante Real Estate will discover this expansive community is home to four distinct neighborhoods. Waters Edge, Northlake Park, VillageWalk and Lake Nona Golf & Country Club each offer their own features and amenities. Properties within Lake Nona range from single family, neo-traditional designs with large front porches to town home-style condominiums. Buyers interested in Lake Nona homes will discover a mix of new construction and resale properties available to suit their needs.